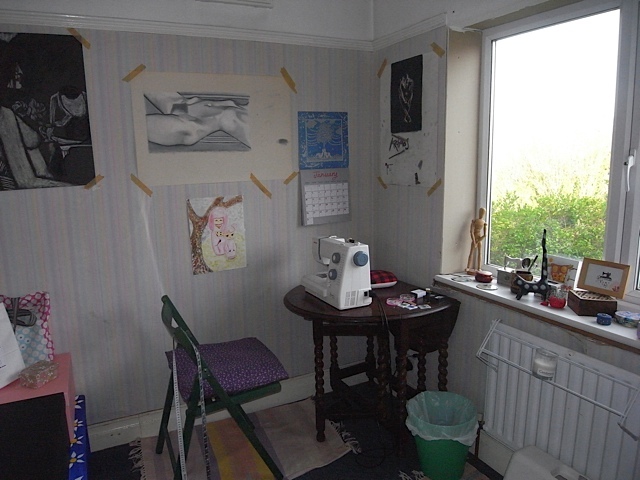 My sewing room. I got rid of all my scrap fabric that was too small to do anything with and maybe some that wasn’t. But it had gotten ridiculous, I had so much I didn’t know what to do with it. I had big ideas that I’d make a quilt one day with all my leftovers, but have since decided that ain’t gonna happen. And was running out of places to store it. So it had to go. I tidied all my fabric into boxes and have made a little rule that if I can’t store it in a box, I can’t buy it! Wonder how long that will last? View from my sewing chair. 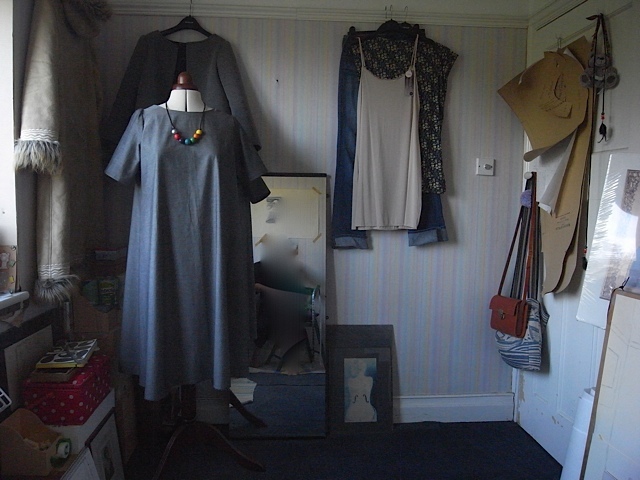 The clothes hanging on the wall are waiting for alterations. Keep putting them off though. View from the door. The art works on the wall are stuff I did twenty plus years ago when I was doing my Art A level at evening classes. Really enjoyed doing that but then my art room got taken over by junk and I sort of lost the passion for it. And then I discovered SEWING! 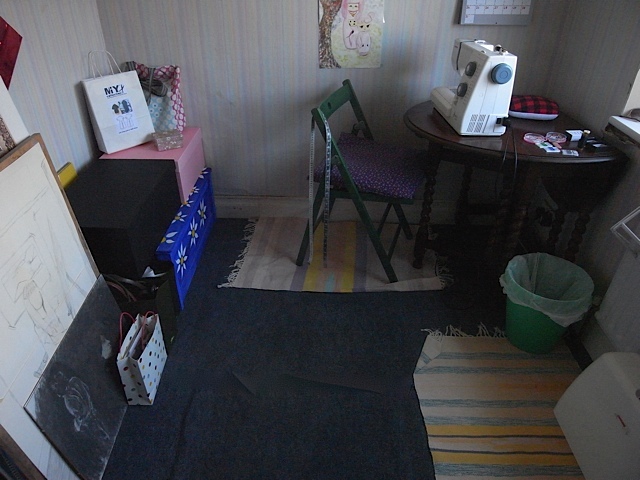 I love my little room, I really can’t tell you the joy that just sitting in there brings, let alone actually sewing. And I still marvel at the fact that I can sew. 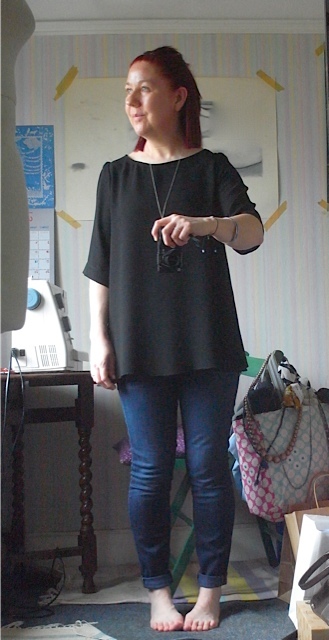 I started off with a plan to make another Trapeze top out of this black 5oz dress weight denim from Merchant and mills. 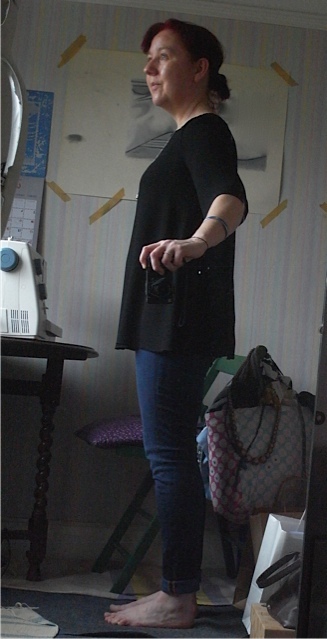 Then I thought it might look nice with contrast sleeves. 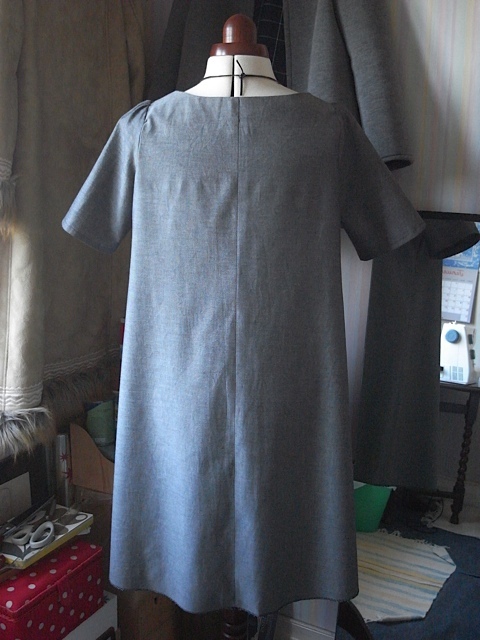 Which means reversing the fabric to show the lovely grey side. 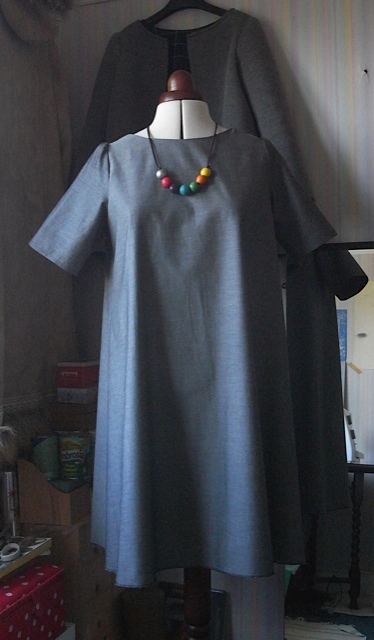 So I laid out the fabric and then wondered if I had enough fabric to make a dress with contrast sleeves instead? 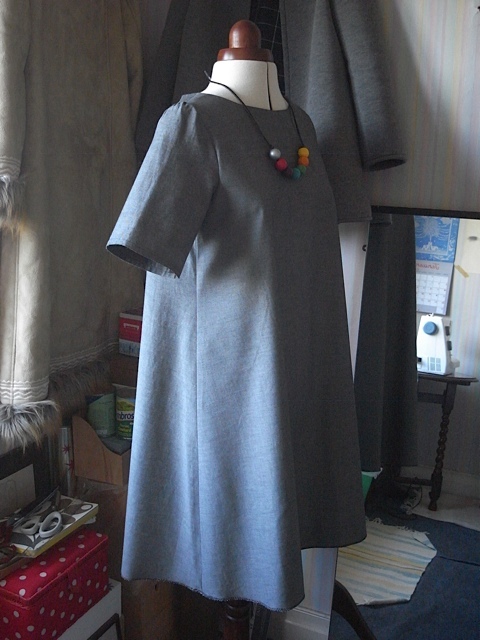 I didn’t quite have enough, but then I remembered I had some left over from previous makes (I’ve used this fabric quite a lot) and joy of joy I had enough for the sleeves and facing, Yay! 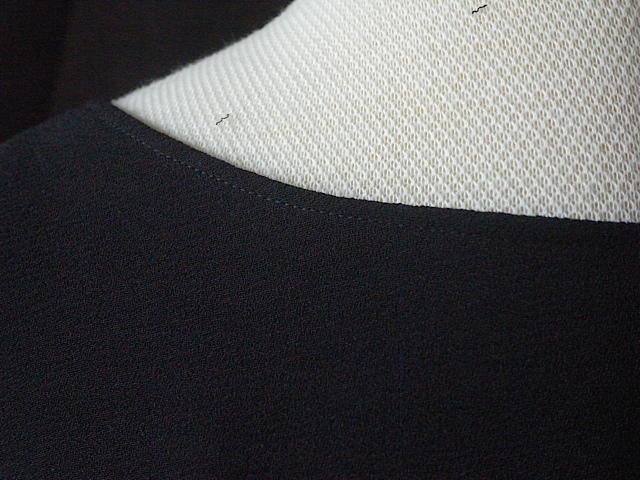 I then thought about making it grey with the sleeves in black, so this is what I set out to do. I’m loving the short sleeves. Not sure if it makes me look pregnant from the side in the pics (I can assure you I’m not), but I don’t think it does in real life. I will most probably wear it with jeans for the most part as my legs are not my best feature and they are very pale and pasty. I also think that worn with high heels it would look good for a party or wedding, with the right accessories. 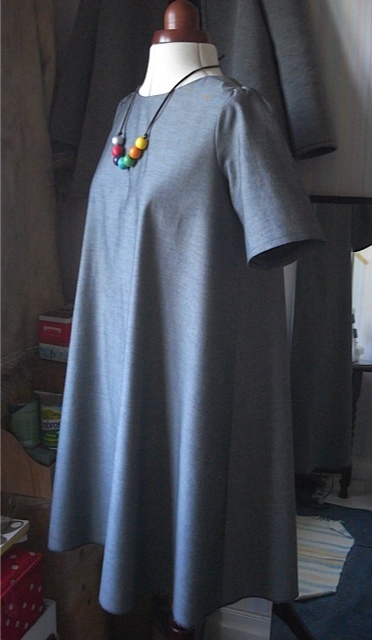 I’m extremely happy with this dress and am also quite amazed at my thought process and how I got from making a black top to making a grey dress. I appear to have become allergic to silver necklaces, maybe. My neck is irritated by something and I’m trying to eliminate the things that I think may be causing it. And one of those things is silver necklaces. 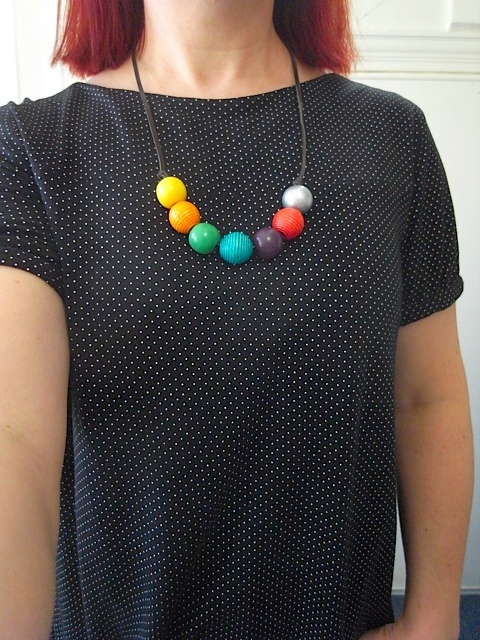 I miss wearing something round my neck and often a necklace can pull an outfit together. So the other morning before I’d even had my morning coffee I made myself a necklace from a bracelet a friend made me a few years back and I’ve never worn, I love the beads but the bracelet didn’t really fit right. 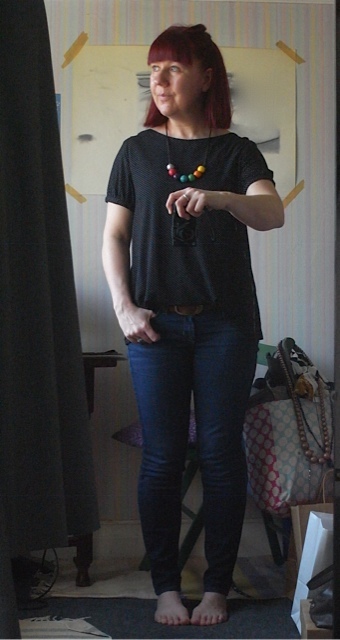 I used leather string to put the beads on, in the hope that it wouldn’t irritate my neck and I’ve worn it quite a lot since making it and so far so good. No sign of irritation. I’m really happy with it and love how it pops against a black background. I love the length too. It works very well so far with all my tops. Loving this crepe fabric, drapes so beautifully. 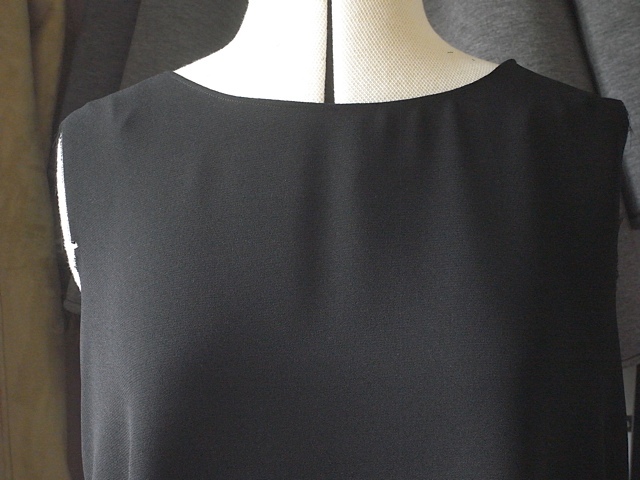 Here it is in a simple black Trapeze top. Bit of a bugger to work with as it frays like buggery. The neck facing was a bit of a nightmare too actually. It kept wanting to roll back outside which was a pain in the arse. I gave it some thought and decided to top stitch round the neck and see if that helped. It did help but created its own problem. The fabric sort of gathered towards the left shoulder. Seems to look Ok and people don’t appear to notice unless I point it out (which I do). Definitely looks better worn than it does on Gertie. 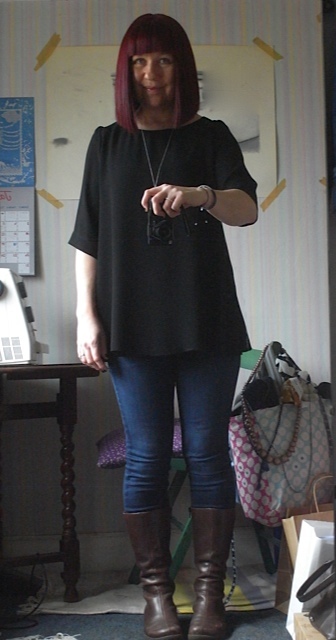 And here’s me wearing it for lunch with friends.